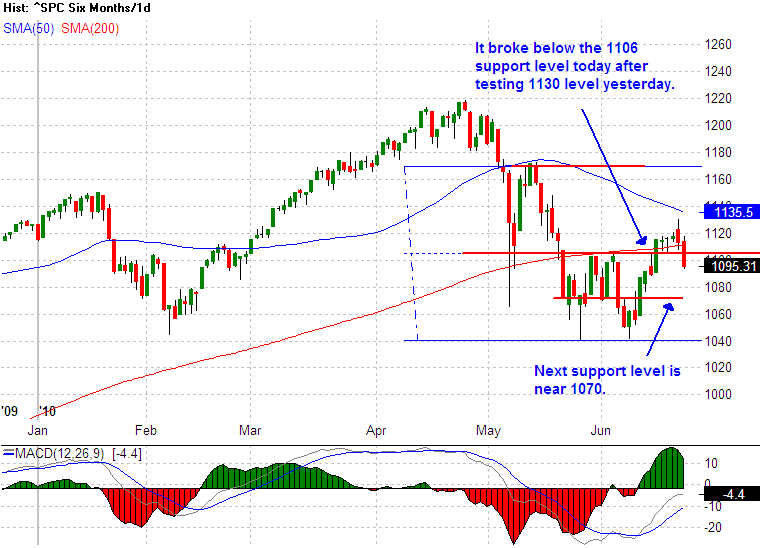 The SP500 broke the 1070 and came down to test the 1040 level with a very negative market sentiment today. Having all the talking heads watching and talking about the 1040 technical level, and having lot of stock with negative momentum price actions, this 1040 level will most likely be broken after it chops around a bit. The long red candle that bought the SP500 down to 1040 level is not a candle that the market will print when it reached a reversal level. If the SP500 breaks below 1040, it might not find support until it reaches the May/July 2009 low in the 870-880 range, and that could get ugly. The SP500 took a slight detour today. 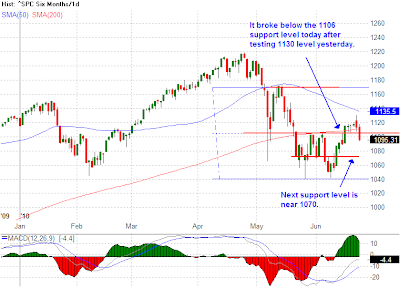 It failed to hold the 1106 support after moving above 1120 and tested 1130 level yesterday. 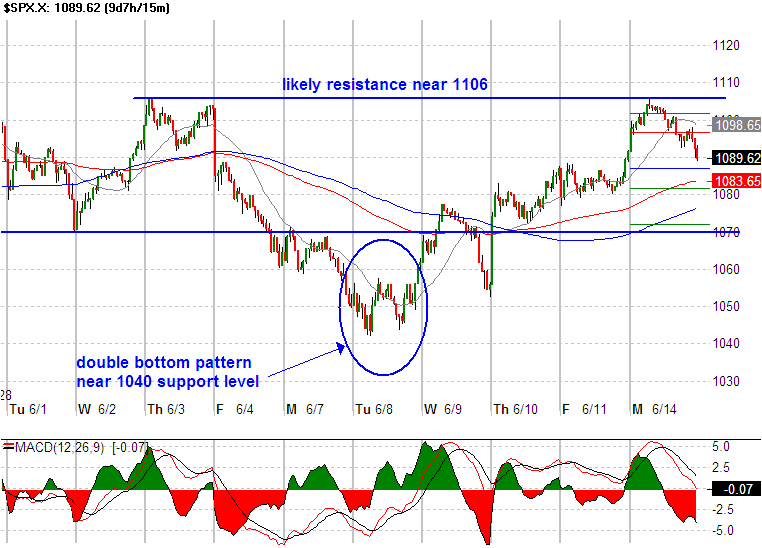 1040 remains to be the major support, but be on the alert for 1070 to provide an intermediate support. If the SP500 can recapture 1106, then it's time for me to go long with the SP500 possibly reaching 1170. 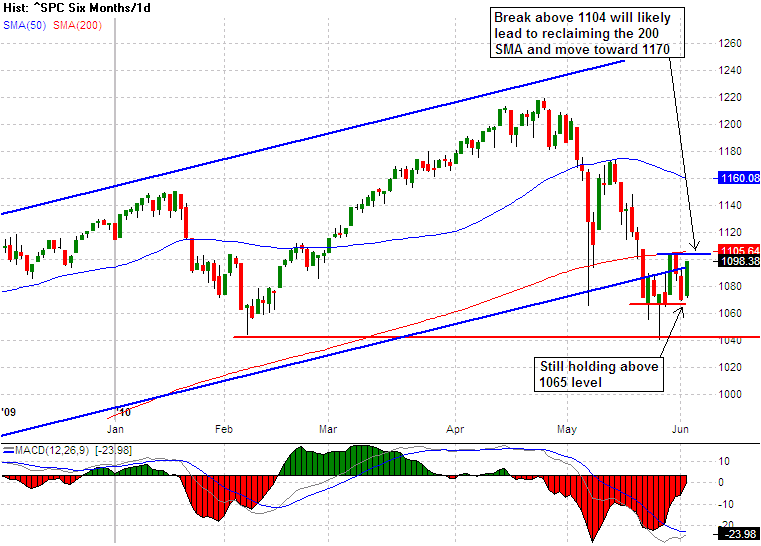 The SP500 busted through the 1106 level and closed at 1115.23 today. The following list of the sector ETF show how broad and strong today’s market rally was. Every sector on the list is green with technology and energy lead the charge. 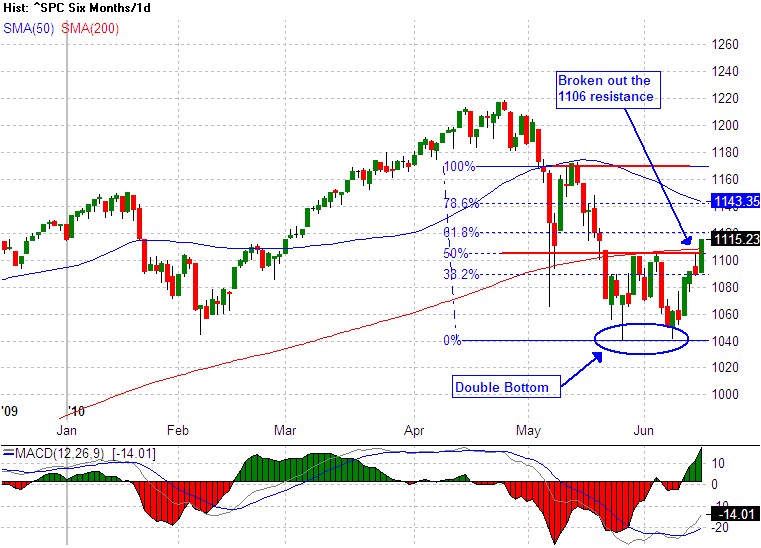 The SP500 made an attempt to breakout of the double bottom pattern today. 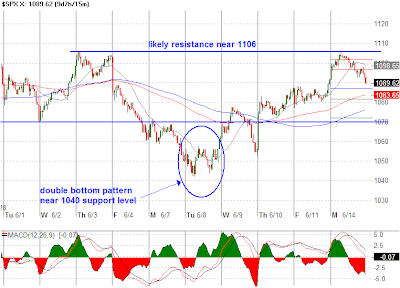 It was not a surprise to me to see it retreats after it has reached the 1106 level. The reasons I was not surprised by the reversal at 1106 level are 1) first breakout attempt on these popularized price pattern usually fail, 2) too many stocks faded from their opening up gap while the market indexes grinded higher, 3) too many market participants were waiting for the breakout to occur. 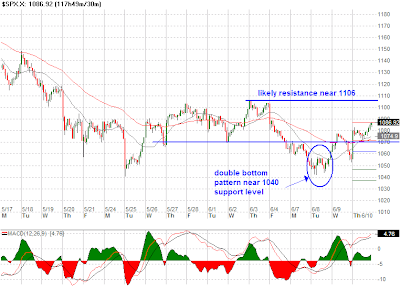 Does it mean today’s failure on breaking the double bottom pattern will result in further selloff? The answer is “not necessary so.” It can sneak up on us and break above it tomorrow, it can regroup by pulling back toward the 1075/1080 level to attract more buyers for the next push, or the bears get bold and drive it down to the 1040 level in another attempt to break below it. Therefore, until one of these possibility plays out, I will monitor the 1075-1080 and the 1106 level for market direction. Since this week is also options expiration, I will be very cautious and try to avoid from being sucked into a position due to false breakout caused by OPEX volatilities. 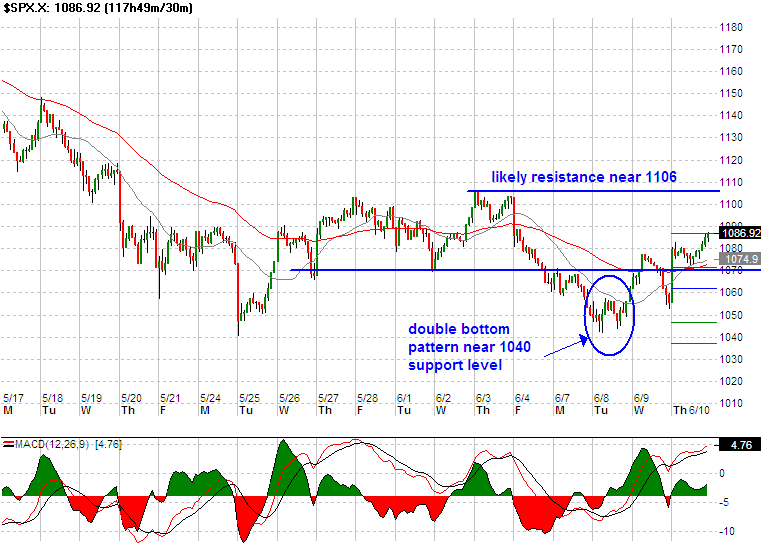 The two recent low near 1040 made by the SP500 formed a potential double bottom. Since next week is options expiration week, the price actions will likely cause the SP500 to move above the double bottom breakout level near 1106. This breakout can cause the SP500 to move toward the 1170 target level projected by the double bottom measured move in one of two possible scenarios. One scenario could be the SP500 will retrace back to the breakout level of 1106 when it reaches the 68% Fib retracement level at 1120, or the other scenario is the SP500 could hit resistance at the 50 SMA near 1140 (the 78% Fib retracement level) then it moves down to test the breakout level of 1106. 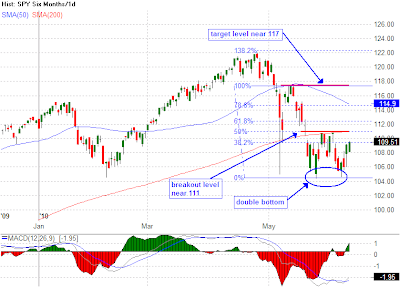 After the SP500 completed a successful test of the breakout level for support, it will resume its move toward the 1170 target. The following is a daily candlestick chart for the SP500 showing the various levels for the double bottom to play out. Below is a daily candlestick chart for the SP500 ETF, SPY applying the same analysis used on the SP500 index to illustrate various levels of possible support and resistance, and the measured move target. After the SP500 broke below 1060 and came near to breaking 1040 level, the market put in a strong rally today and held it through the close. 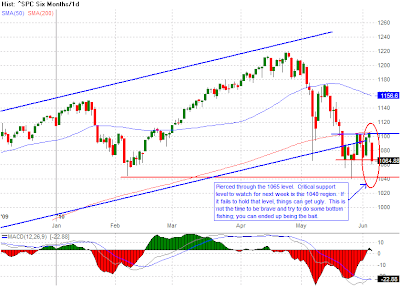 With many talking heads and market participants anticipating the SP500 to break the 1040 support level, the market will do what it always does, defies the majority. Therefore, the market will likely continue its upward move to the 1100 while the masses wait for another test of the 1040 level. After the SP500 closed yesterday above the 1100 at 1102.87, I was prepared to shift gear to be on the lookout for bullish setups. 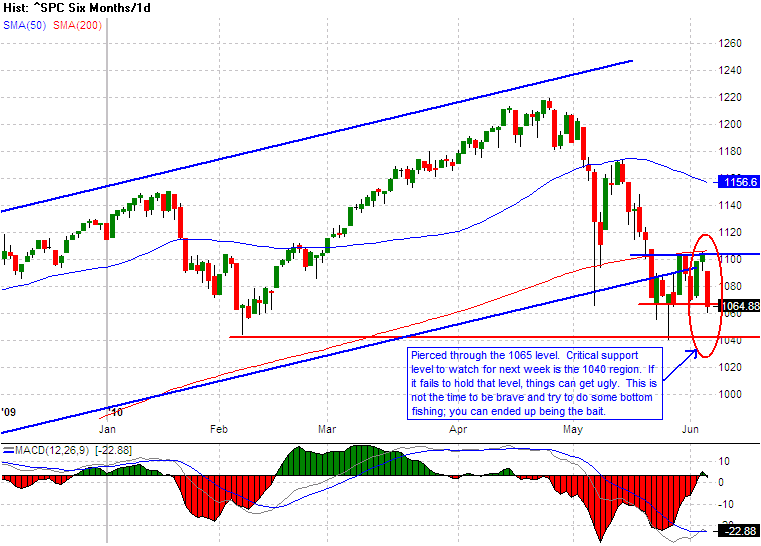 However, with today’s dismal job report and a whole host of negative news flow, the market did one of those sudden reversals and the SP500 ended up closing below the 1065 support level. Fortunately, I was not trapped by any long setups today. For now, I am just waiting to see what Monday will bring, a bounce back above the 1065 or a violent drop below the 1040 level. As I have expressed in recent posts, the current market conditions are for day trading and scalping only. I would not try to be a hero here and go bottom fishing; I could end up being food for the bears. The critical levels for me remain to be 1100 on the upside, 1040 on the downside. 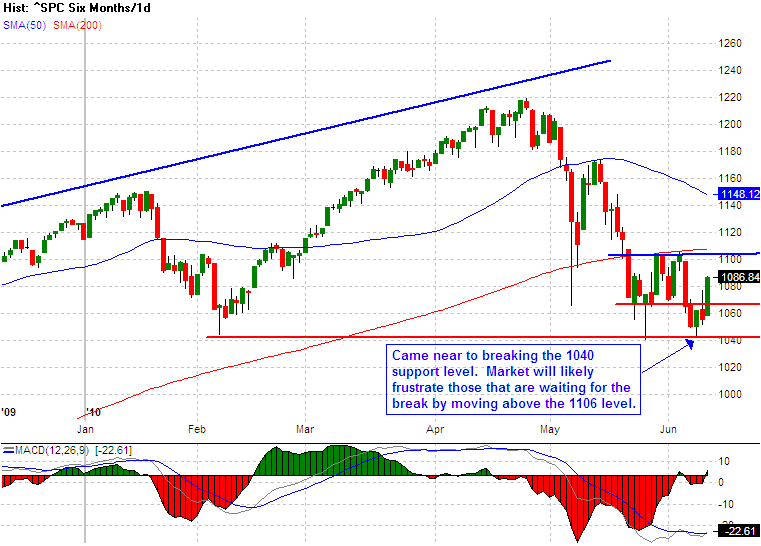 Until the market has made a decisive move on one of these levels, sideline is the place for me to take shelter. The stock market has been selling off toward the close one day, and rallying toward the close the next day, like a roller coaster going up and down. The SP500 seems to be setting itself up to break below the 1065 level and then it reverses and moved near the 1100 level. It is this type of price actions makes it difficult to establish any position other than day trading. But even with these volatile market movements, a sign of consolidation is starting to appear. 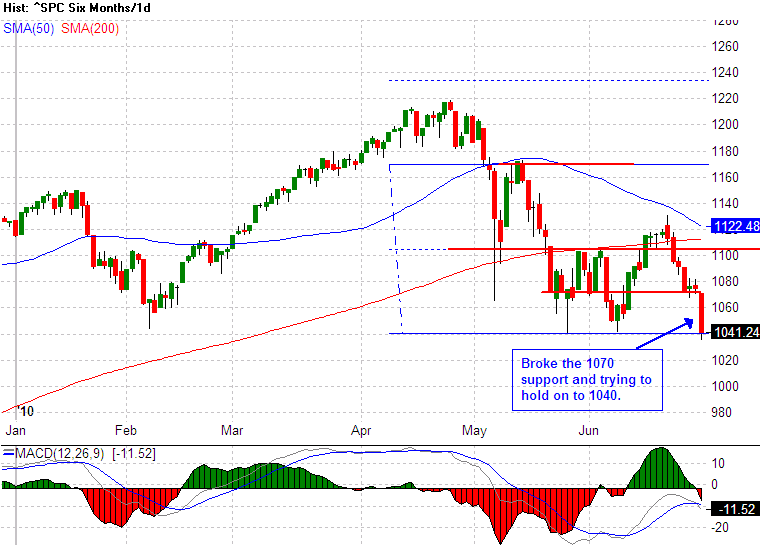 If the SP500 breaks above the 1100 and reclaim the 200 SMA, I will be looking for setups to go long. 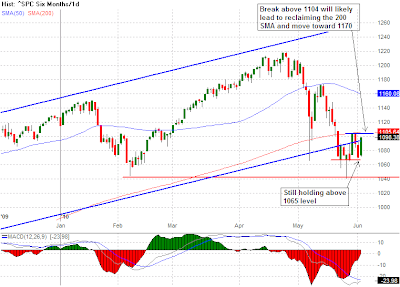 But until the SP500 moved above 1100, I will remain on guard for any sudden reversal that can lead to a break below the 1065 support level and I will be aggressively shorts if it breaks below 1040.